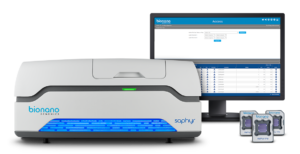 Saphyr®, Bionano’s third-generation optical mapping solution, provides what’s missing in genome research – rapid, high-throughput, long-range genome mapping with unmatched structural variation discovery capabilities. It detects and analyzes large structural variations with exceptional sensitivity and specificity to reveal the true structure of any genome. Saphyr’s breakthrough speed and throughput combined with unmatched structural variation sensitivity make it the ideal solution for human and translational research applications. Saphyr is based on Bionano’s genome mapping, which is the combination of proprietary NanoChannel arrays with optical genome mapping to image extremely long, high molecular weight DNA in its native state. This technology allows for unparalleled structural variation sensitivity, improved genome assembly contiguity up to 1000 times that of short-read sequencing alone and the accuracy to correct sequencing-based assembly errors. Resolve large structural variations missed by next-generation sequencing (NGS) systems. Large structural variations are responsible for many diseases and conditions, including cancers and developmental disorders. Saphyr detects structural variations ranging from 500 bp to megabase pairs in length and offers assembly and discovery algorithms that far outperform sequencing-based technologies in sensitivity.